The Taurus Sign is the second astrological sign in the Western Zodiac. It occurs once every lunar year when the sun appears to pass through the constellation of Taurus. This is known to happen between April 21st and May 21st. People born under the sign of Taurus are thought to be strong-willed and persistent, but can also be stubborn and inflexible. Generous to others, but also self-indulgent. Taurus people are emotionally independent and quite happy to be alone. Taurus people tend to have sensitive temperaments, and are easily offended by careless remarks. They are also said to sometimes have a tendency to fear the unknown. Regarding interpersonal relationships, people who are born under the sign of Taurus are considered most compatible with Cancer, Capricorn, Pisces, Scorpio, and Virgo personalities. 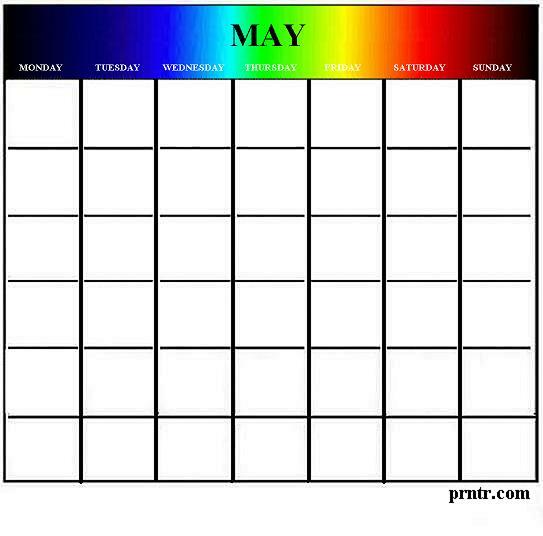 To print the reusable May calendar shown below, just right click on the image and select a SAVE option from your drop-down menu. This will save it to your picture file, where you can adjust the page margins and reduce or enlarge the image as needed. For more clip art, tattoos, next month's calendar, and assorted other free printable items, visit any of the links on this page. The signs of the Western Zodiac occurring in the month of May are Taurus and Gemini. The birth stone designated to represent the month of May is the Emerald. In the United States, the "official" flower that represents the month of May is the Lily-of-the-Valley. Indy-500 auto race (annual sporting event that takes place on the Sunday before Memorial Day in Indianapolis, Indiana). The month of May is also designated Jewish American Heritage Month in the United States. Free Printable Tattoo Photo Galleries. Look here for another selection of Free Printable Items.